Do we even need to mention the role of Facebook in today's world? Point out a single person you know who doesn't use Facebook. That's quite tough, right? Every 9 out of 10 people are found to have a Facebook account. So undoubtedly, it's a very big platform where you can connect with millions of people at a time. Then why not use this platform to grow your small business and promote your brand? Yes, Facebook is the first social media platform that comes in the mind when you think to spread your business. You can easily connect with a lot of people who can turn out to be your potential customers. Facebook can help you a lot to give your brand recognition. But is it as easy as it sounds? Just creating a page on your brand name and you're done? No. When you wish to grow your business, you have to participate actively and wholeheartedly into it. You need to keep a lot of things in your mind while using Facebook as your marketing strategy. Here we mention some tips that can help you promote your brand and attract more and more customers. 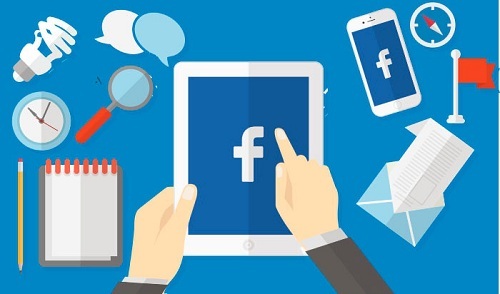 Facebook marketing strategy can be implemented using Facebook groups and Facebook page. So here are the steps that you need to take to implement the plan effectively and make it fruitful. • Know what to post: You can post texts, links, images, videos, and stories on Facebook. Texts are the easiest (use emojis) to post. A link is also a good idea to opt for when you want to share a big article or topic. Videos are the most engaging form of a post at the moment. Share and create good video content on your page. InVideo will help you do so. • Quality rich Content: You know this is quite obvious. People like to follow a page that posts value-rich content. But again, your post should not be too long as it may bore people and they may skip going through it. So, create rich content but keep it short. • Connect personally with visitors of your page: It's good to connect personally with people who land on your page. You can do that through a friend request. Wish them on festivals, occasions, and send them birthday greetings. This will make them visit your page, and they can like your content. • Automatic chatbox when someone lands on your page: Manage the settings of your page and try to connect more and more with people. You can turn on the automatic chatbox when someone lands on your page. This will send a message through your brand page to the person who has visited your page. It will keep customers engaged in your products for some time. • Host Facebook Contests: Contests, giveaways and freebies are good ideas to create brand awareness. A random campaign doesn't require a lot of time and planning. The more you organized such giveaways, the more people will know about your brand and its quality. Not only will it increase engagement in your page but will also attract new followers. • Build Your Community: The basic of Facebook marketing is "It's not about you". Your group is all about the members and how it adds value to their lives. You should build a community where every person takes part freely. • Share things that are trending and relevant to your brand: It's good to share things apart from your brand. The topic surely has to be relevant, but it's okay to not focus on your brand only. Talk about other trading things and share videos for the same. • Respond to Questions and Build Credibility: When customers take part actively in your group, it's your job to respond to their questions and clear any queries that they have. Whenever they comment or ask any question on any of your post, you should replay them. This will not only build a good brand name but will also contribute to the credibility of your brand. "It's all about building a relationship to build a brand." If you observe carefully, every Facebook marketing tip mentioned above helps you build a relationship with your customers or visitors who land on your page. The stronger the bond you can make, the more loyal and potential they'll turn out. So, focus on building relationships, and it will automatically promote your brand. A customer is what builds a brand and relationship is what builds a customer. Rightly said, "It's all about building a relationship to build a brand."